In “Laudato Si’,” commenting on water scarcity, Pope Francis writes, “The environmental repercussions could affect billions of people; it is also conceivable that the control of water by large multinational businesses may become a major source of conflict in this century” (31). In the Canadian province of Ontario, the Holy Father’s intuition seems about right. Following a year of public frustration over the competition for water access and use between local communities and the multinational food company Nestlé, Ontario will have to confront a difficult question: Is water a common good or a private commodity? The issue will be further complicated by the continuing crises of potable water access among First Nations people, which has persisted in some communities for decades. Over the summer of 2016, environmental activists drew attention to the Ontario town of Aberfoyle, where Nestlé was permitted to take 3.6 million litres of water per day—amid a drought—at a rate of a mere $3.71 for every million liters. That’s the standard rate in Ontario for commercial water-taking. The same reservoir near Aberfoyle is also tapped by the city of Guelph, Ontario, which relies solely on groundwater for its growing population, already exceeding 120,000. During the drought, Guelph residents could be fined $130 for watering their lawns, while Nestlé was under no obligation to modify its bottling volume. Nestlé’s Aberfoyle well is not new, but the food giant’s need to renew a 10-year water-taking permit brought attention to the different standards enjoyed by the company versus drought-restricted citizens. Though Nestlé’s permit expired at the end of July, the company has been allowed to continue taking water until Ontario completes a review, a concession made by the Ontario government in light of public outrage. Opposition parties, including the New Democratic Party, the Green Party and the Progressive Conservatives, all urged Ontario Liberals to review the permit granting process entirely, with the N.D.P. and Greens suggesting no renewals until the permit process is significantly changed. Amid the Aberfoyle controversy, another water clash sprung up in Centre Wellington, Ontario, where residents learned that Nestlé had outbid the town for the use of a nearby spring. Aiming to protect public access to water sources with the anticipation of an increasing population, the town attempted to purchase a spring water well, but Nestlé was awarded the well after matching the offer made by Centre Wellington, leading to more head-shaking from citizens frustrated by the imbalance of water rights between a powerful multinational like Nestlé and local municipalities. In protests over the summer, Wellington Water Watchers, a nonprofit advocacy group dedicated to the conservation of local water, gave public voice to continued concerns over the well purchase. Other activist groups, like Council of Canadians, have called for a boycott of Nestlé while drawing attention to the ways in which the well use affects First Nations communities. The well draws water from the Grand River watershed, the traditional territory of the Six Nations of Grand River. More than 11,000 Six Nations people currently live without access to clean water in the region. According to an investigation by The Globe and Mail, one-third of First Nations people are bereft of clean water, a situation that Human Rights Watch notes should be preventable in an advanced nation like Canada. Opposition to expanding the bottled water industry has also come from the Diocese of Hamilton, which includes Wellington. The diocese issued a letter to all its parishes criticizing bottled water use. The Rev. Edward Mahony of Corpus Christi Catholic Church in Hamilton, Ontario, also a member of Council of Canadians, has been known for decades because of his opposition to bottled water, specifically as the industry affects local farmers. Father Mahony brought the issue of bottled water to the attention of priests at a seminar held by the diocese last October. Diminishing bottled water use, says Msgr. Kroetsch, is in keeping with Pope Francis’ “Laudato Si’,” which challenged the idea of water as a commodity and argues, “Access to safe drinkable water is a basic and universal human right, since it is essential to human survival and, as such, is a condition for the exercise of other human rights” (30). Msgr. Kroetsch adds that not using bottled water is “a small step that we all can make, but if we make that step it certainly sends a message to the people who are bottling the water.” With 126 parishes in the Diocese of Hamilton, that step could leave a discernible footprint. All the public outcry has garnered attention from federal and provincial Liberal Party officials. 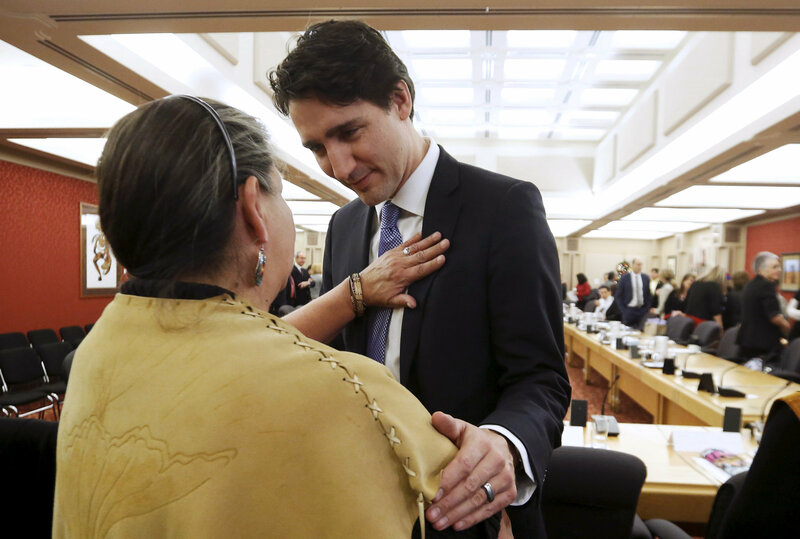 One of Prime Minister Justin Trudeau’s campaign promises had been to end water boil notices in First Nations communities within five years. Now that water politics have come to more privileged parts of Ontario, renewed attention is being placed on commitments to First Nations water access. For its part, in response to the Aberfoyle and Wellington cases, the Ontario government has proposed a two-year moratorium on new or expanded takings from groundwater by bottling companies, as well as stricter rules for renewals of existing permits. It aims during this time to review and research both the state of Ontario’s groundwater and public opinion on its use. In addition to the permit freeze and additional research, Ontario Premier Kathleen Wynne suggested the need for a larger conversation around the private water industry entirely, questioning the consumption of bottled water when most Ontarians have access to clean tap water. Msgr. Kroetsch stated that the diocese would be willing to voice its concerns over water use if it were invited to such a conversation, and that it would continue to try to address the problem at a grassroots level in the meantime. The water issues in Ontario, specifically with respect to the Nestlé company, are also present in other parts of North America, like Michigan, where the company has been embroiled in lawsuits over the damaging volume of water it takes from local water sources for minimal permit fees. Two other Canadian provinces, British Columbia and Quebec, are also being scrutinized for policies on water taking by large bottlers. British Columbia charges private water bottlers a mere $2.25 per million liters of water (before 2016, the water was free). In Quebec, it costs $70 per million litres—a significant hike given the rates at other provinces. That higher rate still represents an incredibly lucrative deal for private companies. The upcoming decisions in Ontario may serve as a model for other governments facing similar conflicts between public and private water interests. Until then, actions on the part of activists and faith communities in Ontario should inspire others to reconsider their lifestyles and make their voices heard for the sake of our common home. It is time to organize a boycott of Nestle products.